U.S. Federal Route 30 runs east-west across Southern Pennsylvania. It enters the state from West Virginia, near Hookstonw, and runs through Pittsburgh, Everett, Chambersburg, York, and Lancaster. Near Philadelphia, it enters New Jersey. Info on U.S. Rt. 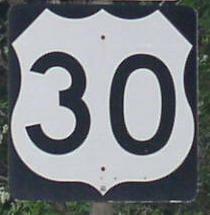 30 is broken down by county below.